Vancouver Codes by Douglas Coupland is the 8th work in the yearlong 10 Seconds project curated by Paul Wong. 10 Seconds is presented by On Main in partnership with inTransitBC and commissioned by The City of Vancouver Public Art Program with the support of Vancouver 125 and the participation of the Government of Canada. Vancouver Codes is the latest manifestation of recent new work by Douglas Coupland that extends the graphic black and white QR code into the realm of colorful modernist paintings, while retaining the code’s original interactive function. Vancouver Codes is launching on Canada Line video screens January 16 – 31, 2012, on YouTube, Facebook and at www.onmaingallery.com. A QR code (Quick Response code) is a type of matrix barcode designed in 1994 by Toyota subsidiary Denso Wave and first used for vehicle tracking during manufacturing. More recently, this system has become popular outside of industry due to its easy programmability, large storage capacity and high-speed decoding facility. QR codes consist of black modules arranged in a square pattern on a white background. Information contained in codes is made up of data (numeric, alphanumeric, byte/binary, Kanji) and can be linked to a web url. Simple to use, QR codes are readable on camera phones using a QR reader application. QR reader applications make use of the phone’s camera to scan the code, decode it, and present information on screen. 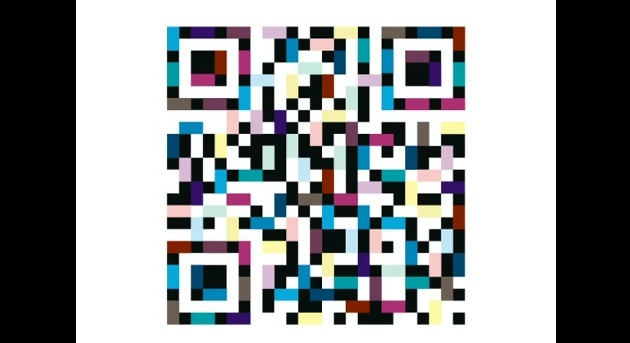 In 2011, Coupland exhibited several series of new paintings that riffed on the use of QR codes. The paintings function as both 2-D works of art and as codes that can be scanned to receive a message. Two of these paintings ‘Live Long And Prosper’ and ‘ Everything Beautiful is True’ are part of Vancouver Codes. Vancouver Codes is 10 seconds of elegantly shifting codes that link to twenty pieces of data: including YouTube videos, photographs of various sites such as Grouse Mountain, VanDusen Gardens, public artworks including Coupland’s Digital Orca and Terry Fox sculptures, and written messages. He has also created a QR code that links to www.onmaingallery.com: all reasons to take out your smart phone, scan that screen, and see where Coupland takes you.